Hello! For the past 5 days we've been sharing projects featuring the products from the new December release from My Favorite Things! Well the time to shop for all of the new awesome products is here, because everything is available in the MFT online store now! To create the fun winter boy I used the boy image from the new Our Story stamp set and modified him a bit. ;) I stamped a coloured the winter toque from the snowman in the Cooler with you stamp set, gave the boy a bit of a haircut and then put the hat on him. To create the scene in the background, I diecut a piece of watercolor paper (for the texture) with the scalloped rectangle from Blueprints 27 and then I cut it into three pieces using the Hit the Slopes dies. I then added some aqua and green Distress ink to another piece of watercolor paper and cut out all of the trees for the scene. Once I had the background done I stamped the sentiment onto a Stitched Fishtail Banner Stax and added it the the bottom right area of the snow hills. Thanks for joining me all week as we shared the new products! I can't wait to see what everyone gets and creates! Make sure to head over to the MFT Stamps blog for more great ideas from the design team and giveaways! Adorable card. Love the versatility of the stamps to enable a little altering. Charming and a nice use of unexpected colors! Cute card, I enjoy watching your videos. Really adorable card. Love the colors used on the little boy! What a sweet card! Love your trees on the slopes and the colours you made them. Adds an extra touch of whimsy. such a sweet little guy on your card! Really like how you did the trees! Adorable! Super cute card....love how you layered the trees! 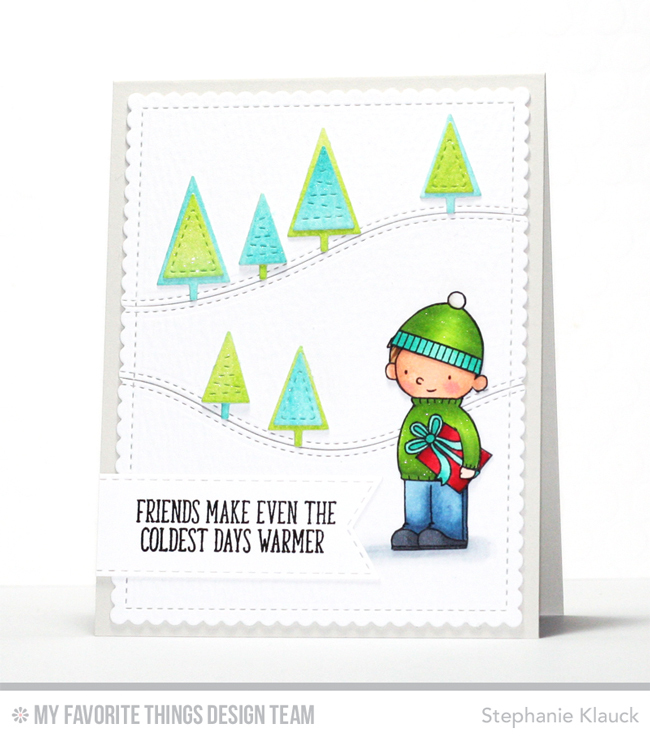 Love this sweet scene you created with the Hit the Slopes and Winter Trees Die-namics! Darling card with a great color combo! Great job with the charming little boy! Oh my goodness! How very creative you are. Such a fun idea to stick the present under his arm! Love how you changed the stamp to make it a winter scene! Such a cute card! Thank you for the inspiration!! Great use of different stamp sets! It worked great! Cute card. Love the way you added the present under his arm- brilliant. I'm in love for your sweet card!!! Too cute!!! Love the layering on the trees, the gift under his arm and colors used. Im loving these cute little trees, they really add to a scene. Again another great crad. This is a perfect card for a boy. What a great design. I really like the blues and greens. The greens in the trees and on the boy are fabulous a gainst the snowy background! Your fabulous stamp image "changes" make this a truly unique card that is just beautiful! What a sweet card. It's absolutely adorable! Awwww, this is absolutely adorable!!! I love how you altered the image to make the little boy carrying a present outdoors! So sweet! Love that little boy and the colors your used on the trees! Your creations are always very unique and this card is no exception! Love it! I love the warm colors on this card, makes me happy! I love how you creatively slid the gift on the boy's arm. Very nice. Very cute modifications. Love the non traditional colors too. Love the stitched pine trees. Looks like he's come a ways to deliver his gift. Thanks for sharing! Love the modifications ... great card! Loving the colors and the fun dies and stamps. Awesome card. Those trees are super cute - such a sweet card! Really cute card. Love your scene. This is so sweet, Stephanie! Really adorable scene! Love it! What a fun card and those little boy and girl dies are so cute! What a cute card & fantastic use of all those dies! Very smart stretching of stamps - I love all of your modifications, really fun! I would have never guessed that this wasn't the original stamp, had I not known what it looked like from the release ;-) AND i love the colours you used - simply fab! Awww...super sweet card...I LOVE IT! Such a fun card. Also love how you created your slopes without adding additional layers. Perfect for mailing! Love the two-toned trees! Cute card!! Those are great blue and green trees. Too cute! I always love your cards, Stephanie!